Memoir: Teta, Did You Know Aleppo? Who took this picture of you, Teta Marie, in the garden of your house in Egypt? Was it your son, who loved those Alexandrian afternoons? And the women – mother, aunt, wife, sister, daughter, who spent every afternoon in that garden? Were they his anchor, his identity? Was he defined by the uprooting of his mother from Aleppo, his father from Ehmej, his wife’s family from Chios? Did this garden in Alexandria represent the roots of his Levantine identity? Is that why my father had so many pictures of his mother’s garden? Why does your daughter-in-law hold on to your arm so warmly in that garden where she walked me every afternoon in my stroller? Did you embroider the bonnet and bib I am wearing in the other picture taken that day? Did you know that I would one day scan these pictures eagerly for hints of who you were? And why are there so many pictures of the first two years of my life? Is it because the garden stopped existing when you were there no more? Did I ever actually call you Teta? 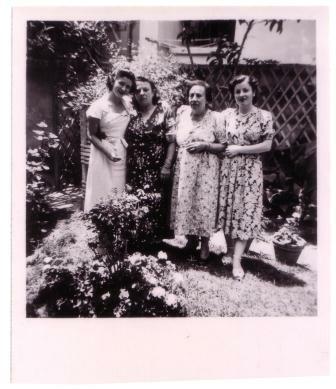 Why did my mother think she was the favorite of your five daughters-in-law, she who was “the foreigner”, the Greek who spoke barely comprehensible Arabic? How did you communicate together, when you taught her to cook that walnut and pepper dip called mhammara, one of your son’s favorite dishes? What did it mean for you to be from an Aleppine family? Did you actually know Aleppo? Do you know that Aleppo is burning, Teta? When did you come to Alexandria? What journeys did you undertake? How old were you? Did you take a boat from the port of Beirut and across the Mediterranean to Egypt? Did you feel like a foreigner when you arrived in Egypt? Did you feel strange speaking a dialect of Arabic that made Egyptians laugh? How did you meet your husband? What did you feel at 36 when your husband died suddenly, leaving you alone with eight children? Is it true that my grandfather had no brothers or sisters? How could you raise your children, clothe them, feed them, school them? Did you really sell all your jewelry, and that of your sister-in-law, who lived with you? Was that so you and she, a widow who had no children, could share the costs? Did you help each other so your children, whom she loved, would want for nothing? Is that why she holds on to your arm, and my aunt to hers, in this picture? How did you manage, a single mother with eight children, the eldest aged 15 and the youngest not even a year old? How hard was it to raise a baby girl- the glowing young woman to your left in the picture- without a father? Is it true that my father was your favorite? Of your eight children is he the one who most resembled his father? Was the resemblance physical, or were there other qualities that made him dear to you? And the three gold bracelets that you wear in the photos? Did my father really buy them for you to replace the jewelry you had been forced to sell? Is that why you had a soft spot for him always? Are those geraniums, roses, and jasmine bushes in the picture? Is that why our balconies in Alexandria, Beirut and later, our garden in Sydney, always had to have geraniums, roses and jasmine? Did you ever imagine that Egypt would one day cease to be a safe haven and we would go back to Lebanon? Could you believe that we would then emigrate to Australia, when Lebanon became precarious? Do I detect a smile there, Teta? Did you have a sense of humor? Does my question surprise you? Did you know that one of my earliest memories of my father was his subtle wit? And did you know that his granddaughter has had that same trait since early childhood? Do you know how I feel, Teta, that my daughter may have inherited this gift from her great-grandmother? Mishka Mojabber Mourani’s most recent book is ALONE TOGETHER, co-authored with Aida Yacoub Haddad. It is published by Kutub – Beirut, 2012. ISBN: 9789953554167; you can read more about the bilingual project here. Mourani is also the author of the memoir BALCONIES, which is distributed by Lebanon’s Dar an-Nahar. This is LOVELY! LOVELY! Thanks for sharing it. Thank you, Nora. And thank you, Marcia, for posting it. I have been delving into my parents’ and grandparents’ history and the moments when they too were refugees; and I am bereft that none of them still exists to whom I can ask the pointed questions Mishka poses to the photograph. It is a broken recording from which one only hears distorted fragments. We may not have them on record, but our quest[ions] will bear witness? Teta, a tender warm word that transports me to places, stories, hugs, chants I haven’t recalled for a long time. Did you know that Aleppo is burning, Teta? Very touching…. Thank you Mishka, as always, for the genuine thoughts and the wonderful words. Charming, nostalgic and touching … I loved it. Each picture hides a world! Merci Mishka. Vraiment tres beau, tres sensible ! Je te remercie, Hayat. J’ai hate de te lire! Mishka, I was so touched reading ‘ Teta, did you know Aleppo?’ Very beautiful…….. Thank you! We all have so many unanswered questions of that generation, not so? So beautiful, so absolutely beautiful. As the first-generation son of Arab parents who was born/raised in the US, but studied in Lebanon, in part, to seek some of the same answers to those you have… I understand. My family moved from Syria, to Egypt, to Lebanon to America. And left so many questions unanswered, many that have since been buried in either the sand or in the rubble of our homeland. Your post has stirred up so many emotions in me and I have not stopped thinking of my dear grandmother who passed away 10 years ago. How fragile and elusive memory is, and how important it for us to be the record keepers of our family legacy! Often however, all we can do – as you do with your beautiful photo – is imagine that history from the priceless fragments we still luckily possess. Very touching mishka , may your tetas city peace be restored , and really teta is a word we seniors miss, and iguess thats why we repeat it with pur grandkids as if to we insisting on never to forget it …… May Allah bless your girls ! Still i want to read more ! I always wondered why grandmothers call their little ones “teta” or “sitto” in Arab culture- I love your explanation!